What is Referral Spam and Why is it Bad? These bots are not real visitors to your site creating the hit and leaving with a 100% bounce rate and zero session duration. They therefore increase overall count of sessions and bounce rate, and decrease overall session duration. 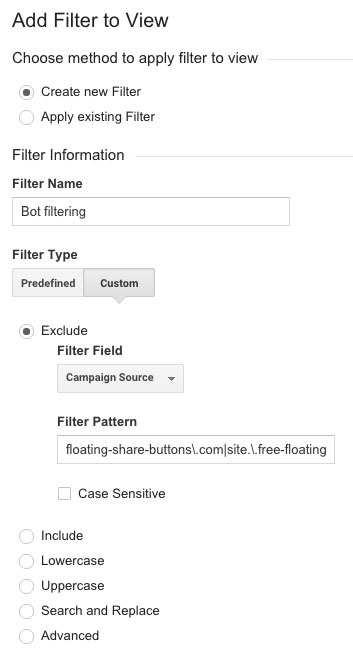 In Admin -> View Settings create a copy of your current view with a descriptor of bot filtering. In View Settings of your new view, check the box under Bot Filtering to exclude all hits from known bots and spiders. Switch from View Settings to Filters. Click the red “+Add Filter” button. If your view is new, filter verification will not work because no data has been collected for that view. Back in the reporting view, add an annotation below the graph as documentation of changes made.